ActivaPatch® IntelliDose™ 2.5 To view the official ActivaPatch® website click here. Intelligent, accurate iontophoresis delivery with SmartPower™ LED to provide visual feedback to clinicians and patients. ActivaPatch® IntelliDose™ 2.5 is a disposable, single use, non-invasive iontophoretic drug delivery system that utilizes an intelligent microprocessor to deliver 40 or 80mA*min dosage of a negatively-charged ionic solution. Patch delivers 40mA*min dose in 1.25 hours, or 80mA*min dose in 2.5 hours. 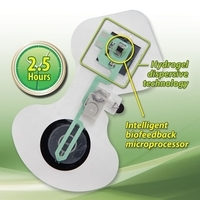 Accurate timing and dosage ± 2% versus other wireless iontophoresis treatments that can be as much as ± 37%. Self contained and fully integrated SmartPower™ system functions without a charging station or dose controller. Can be removed and reapplied to complete treatment if necessary or used for two treatment sites. Flexible, low-profile eliminates skin irritation with no adhesive burns from prolonged wear. Detects and measures skin resistance for optimal drug delivery. Each pouch contains the active ActivaPatch®, alcohol wipe and a patient instruction card.